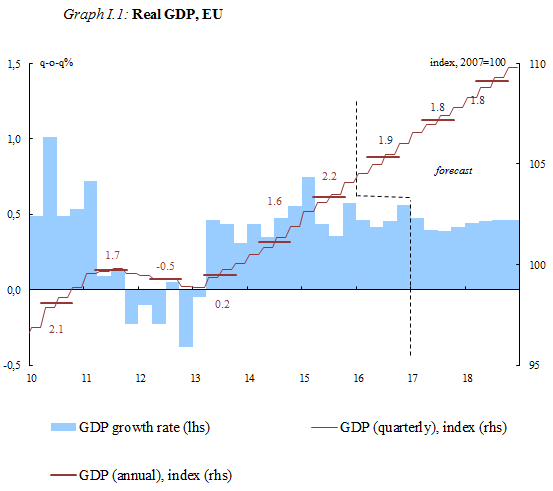 Real GDP in the euro area has grown for 15 consecutive quarters, employment is growing at a robust pace and unemployment continues to fall, although it remains above pre-crisis levels. Private consumption is still the engine of the recovery. Investment growth continues but remains subdued. In its Winter Forecast released today, the European Commission expects euro area GDP growth of 1.6% in 2017 and 1.8% in 2018. This is slightly revised up from the Autumn Forecast (2017: 1.5%, 2018: 1.7%) on the back of better-than-expected performance in the second half of 2016 and a rather robust start into 2017. GDP growth in the EU as a whole should follow a similar pattern and is forecast at 1.8% this year and next (Autumn Forecast: 2017: 1.6%, 2018: 1.8%). Growth prospects for advanced economies outside the EU have improved over recent months, largely due to expectations of fiscal stimulus in the United States, which have resulted in higher long-term interest rates and an appreciation of the US dollar. Growth in emerging market economies is also set to firm up to 2018, although to varying degrees across countries and regions. Overall, this could give a boost to European exports of both goods and services following a weak 2016. Inflation in the euro area has recently picked up as the past drop of energy prices has recently given way to an increase.. Having been very low over the past two years, inflation is now set to reach higher levels this year and next, though still short of the target of “below, but close to 2% over the medium term” defined as price stability. Core inflation, which excludes volatile energy and food prices, is set to rise only gradually. 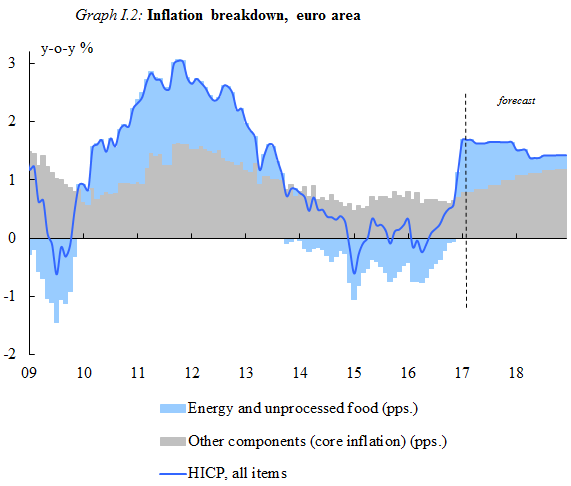 Overall, inflation in the euro area is expected to increase from 0.2% in 2016 to 1.7% in 2017 and 1.4% in 2018. In the EU, inflation is forecast to rise from 0.3% in 2016 to 1.8% in 2017 and 1.7% in 2018. Private consumption is set to remain the main growth driver, supported by sustained improvements in employment and a rise in nominal wage growth. However, with inflation rising and limiting the growth of household purchasing power this year and next, private consumption growth is expected to slow. Investment is set to continue growing but only moderately, supported by a number of factors such as very low financing costs and strengthening global activity. Projects financed under the Investment Plan for Europe should increasingly support private and public investment as they move from approval to implementation. Overall, investment in the euro area is forecast to grow by 2.9% this year and by 3.4% in 2018 (2.9% and 3.1% in the EU), up 8.2% by now since the start of the recovery in early 2013. However, the share of investment in GDP remains below its value at the turn of the century (20% in 2016 compared to 22% in 2000-2005). This persistent weakness in investment casts doubt over the sustainability of the recovery and the economy's potential growth. The economic recovery continues to have strong positive effects on labour markets, following extensive structural reforms in several Member States. Employment growth is projected to remain relatively solid, albeit slightly less dynamic in 2017 and 2018 than last year. The unemployment rate in the euro area is forecast to decline further, from 10.0% in 2016 to 9.6% this year and 9.1% in 2018. In the EU as a whole, unemployment is expected to fall from 8.5% in 2016 to 8.1% this year and to 7.8% in 2018. These are the lowest unemployment figures since 2009 but remain above pre-crisis levels. The aggregate euro area public deficit and the government debt-to-GDP ratio are expected to fall further in 2017 and 2018. 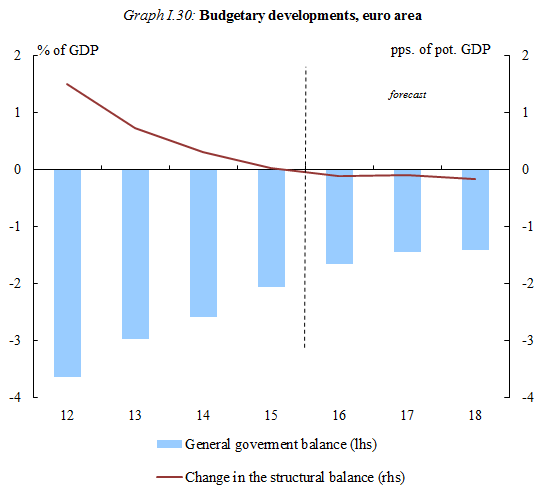 The public deficit for the euro area is expected to decline from 1.7% of GDP last year to 1.4% in 2017 and 2018. This decline reflects lower interest spending due to exceptionally low interest rates. It also reflects further improvements in the labour market: more people are paying taxes and contributions, and fewer are receiving social transfers. The debt-to-GDP ratio is expected to diminish gradually from 91.5% in 2016 to 90.4% in 2017 and 89.2% in 2018. For the first time since 2008, the Commission's forecast points to economic growth across all EU Member States for the entire forecasting period (2016, 2017, 2018). Even those Member States most hit during the recession are also expected to have returned to growth last year. The impact of the US dollar’s appreciation and higher long-term interest rates could, however, increase the differences in growth rates among Member States. The particularly high uncertainty surrounding this Winter Forecast is due to the still-to-be-clarified intentions of the new administration of the United States in key policy areas , as well as the numerous elections to be held in Europe this year and the upcoming "Article 50" negotiations with the UK. The balance of risks remains on the downside although both upside and downside risks have increased. In the short term, fiscal stimulus in the United States could have a stronger impact on growth than currently expected. In the medium term, risks to the growth outlook stem from legacies of the recent crises; the UK's vote to leave the European Union; potential disruptions to trade; faster monetary tightening in the United States, which could have a negative influence on emerging market economies; and the potential consequences of high and rising debt in China . This forecast is based on a set of external assumptions concerning exchange rates, interest rates and commodity prices with a cut-off date of 1 February 2017. The numbers used reflect market expectations derived from derivatives markets at the time of the forecast. For all other incoming data, including assumption about government policies, this forecast takes into consideration information up until and including 1 February 2017. Only policies credibly announced and specified in adequate detail are incorporated. Projections assume no policy changes. 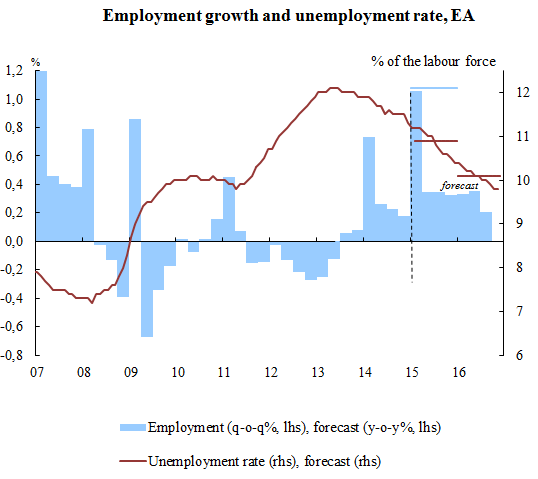 Putting the forecast into perspective: how persistent are crisis effects in the euro area?